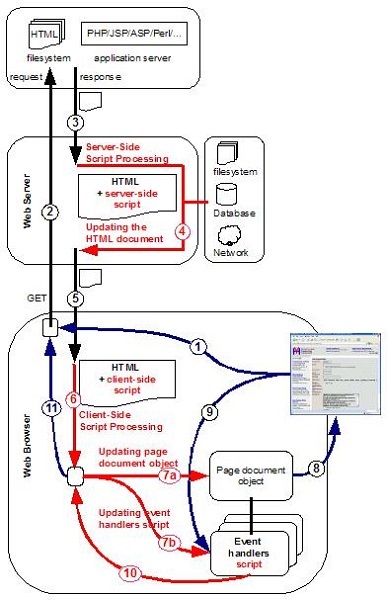 This section provides an overview of a typical Web scripting processing flow architecture showing server-side and client-side scripting steps. Server-Side Scripting - Scripts embedded in HTML documents to be processed by the Web server before sending to the client - Web browser. Server-side scripting usually used to interact with database or other backend applications and to bring dynamic data into HTML documents. Client-Side Scripting for Page Document Building - Scripts embedded in HTML documents to be processed by the Web browser before rendering the page document on the browser window. Client-Side Scripting for Browser Event Handling - Scripts embedded in HTML documents to be processed by the Web browser when user interacts with the Web browser window.